If you’re new to using Scapy, start with the usage documentation, which describes how to use Scapy with Ethernet and IP. 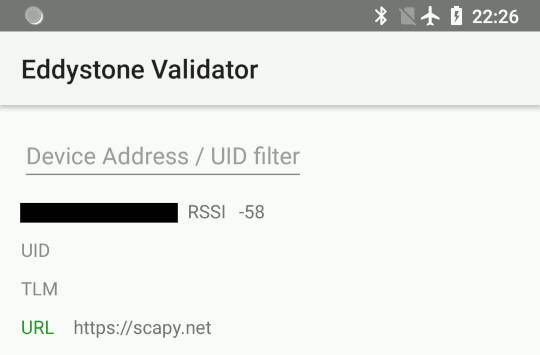 Scapy does not support Bluetooth interfaces on Windows. Bluetooth is a short range, mostly point-to-point wireless communication protocol that operates on the 2.4GHz ISM band. Bluetooth standards are publicly available from the Bluetooth Special Interest Group. These are the “classic” Bluetooth physical layers. BR reaches effective speeds of up to 721kbit/s. This was ratified as IEEE 802.15.1-2002 (v1.1) and -2005 (v1.2). EDR was introduced as an optional feature of Bluetooth 2.0 (2004). It can reach effective speeds of 2.1Mbit/s, and has lower power consumption than BR. In Bluetooth 4.0 and later, this is not supported by Low Energy interfaces, unless they are marked as dual-mode. Introduced as an optional feature of Bluetooth 3.0 (2009), this extends Bluetooth by providing IEEE 802.11 (WiFi) as an alternative, higher-speed data transport. Nodes negotiate switching with AMP. This is only supported by Bluetooth interfaces marked as +HS. Not all Bluetooth 3.0 and later interfaces support it. Introduced in Bluetooth 4.0 (2010), this is an alternate physical layer designed for low power, embedded systems. It has shorter setup times, lower data rates and smaller MTU sizes. It adds broadcast and mesh network topologies, in addition to point-to-point links. This is only supported by Bluetooth interface marked as +LE or Low Energy – not all Bluetooth 4.0 and later interfaces support it. Most Bluetooth interfaces on PCs use USB connectivity (even on laptops), and this is controlled with the Host-Controller Interface (HCI). This typically doesn’t support promiscuous mode (sniffing), however there are many other dedicated, non-HCI devices that support it. This is the “base” level interface for communicating with a Bluetooth controller. Everything is built on top of this, and this represents about as close to the physical layer as one can get with regular Bluetooth hardware. Sitting above the HCI, it provides connection and connection-less data transport to higher level protocols. It provides protocol multiplexing, packet segmentation and reassembly operations. When communicating with a single device, one may use a L2CAP channel. RFCOMM is a serial port emulation protocol which operates over L2CAP. Linux’s Bluetooth stack is developed by the BlueZ project. The Linux kernel contains drivers to provide access to Bluetooth interfaces using HCI, which are exposed through sockets with AF_BLUETOOTH. A daemon that provides access to Bluetooth devices over D-Bus. An interactive command-line program which interfaces with the bluetoothd over D-Bus. A command-line program which interfaces directly with kernel interfaces. Support for Classic Bluetooth in bluez is quite mature, however BLE is under active development. You must run these examples as root. These have only been tested on Linux, and require Scapy v2.4.3 or later. Unless your computer is doing something else with Bluetooth, you’ll probably get 0 packets at this point. This is because sniff doesn’t actually enable any promiscuous mode on the device. However, this is useful for some other commands that will be explained later on. This requires a Bluetooth 4.0 or later interface that supports BLE, either as a dedicated LE chipset or a dual-mode LE + BR/EDR chipset (such as an RTL8723BU). These instructions only been tested on Linux, and require Scapy v2.4.3 or later. There are bugs in earlier versions which decode packets incorrectly. These examples presume you have already opened a HCI socket (as bt). >>> # sometimes contain different data! >>> # The lfilter will drop anything that's not an advertising report. You can sometimes get multiple HCI_LE_Meta_Advertising_Report in a single HCI_LE_Meta_Advertising_Reports, and these can also be for different devices! # Get one packet for each device that broadcasted short UUID 0xfe50 (Google). # Android devices broadcast this pretty much constantly. Changing advertisements may not take effect until advertisements have first been stopped. # Eddystone_URL.from_url() builds an Eddystone_URL frame for a given URL. 16-bit UUIDs for members: List of registered UUIDs which appear in EIR_CompleteList16BitServiceUUIDs and EIR_ServiceData16BitUUID. 16-bit UUIDs for SDOs: List of registered UUIDs which are used by Standards Development Organisations. Company Identifiers: List of company IDs, which appear in EIR_Manufacturer_Specific_Data.company_id. Generic Access Profile: List of assigned type IDs and links to specification definitions, which appear in EIR_Header.